Fishers Island Water Works Corporation History – Fishers Island Utility Co.
E.M. & W. Ferguson’s Fishers Island Water Co.
E.M. & W. Ferguson’s Fishers Island Water Co. began providing water to the residents of Fishers Island in 1904 when two of the east end lakes were harnessed as a water supply. That year they built a water distribution system consisting of a pumping station, a pumping main, and a reservoir. Prior to the establishment of the pumping station, fresh water on Fishers Island was provided by private wells. The heart of the entire 1904 water system was the brick pumping station located on Barlow Pond that pumped potable water through a pumping main from Barlow Pond (13 acres surface area) and adjacent Island Pond (47 acres) to the Belle Hill Reservoir atop Shingle Hill. The original Belle Hill Reservoir—perched above the Mansion House Cottages—had a capacity of 330,000 gallons, a diameter of 51 feet, a depth of 22 feet, and 24-inch thick brick walls. Water was gravity fed from its tank which stood at the highest spot on the west end. When the eastern two-thirds of Fishers Island were developed in the mid-1920s, a second large reservoir was built atop the east end’s Chocomount Hill with a capacity of 500,000 gallons. After its completion in 1926, this new “Top of the World” site became the preferred reservoir that was used whenever possible to supply the whole system. It became the sole reservoir for the Island’s water works after the wooden roof of the Belle Hill Reservoir decayed in the late 1950s. Middle Farms Pond (32 acres) was added as a backup source during the spring of 1926. As part of the development of the east end, a Filtration Plant was built in 1927 to treat, filter and chlorinate the Island’s lake-based water supply. The Filtration Plant remained in operation until 1988. After Island Pond was breached during the 1938 Hurricane, it was subsequently restored as a fresh water lake. When it was breached again by another hurricane in the 1940s, it was permanently disconnected from the reservoir system. Island Pond is better known today as “Oyster Pond” for its brackish water has been utilized for oyster cultivation for over 50 years. Test wells were dug in 1988 to enable the 60-year old Filtration Plant facility to be taken off line for maintenance. The wells, located in the aquifer of Middle Farms, provided a plentiful supply of good quality water and proved cost effective. They have been the Island’s primary source of water since 1990. The Filtration Plant remains on “stand by” status, but is still used in July, August and September to augment the well system. 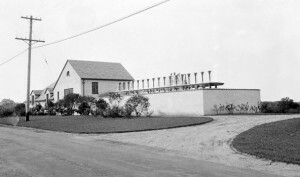 Construction of the New Water Filtration Plant, Fishers Island, NY, circa 1927. – View photo gallery on The Henry L. Ferguson Museum website.